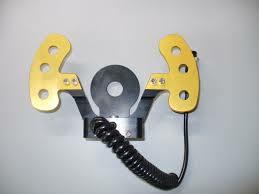 THESE PADDLES WORK WITH VIRTUALLY ALL MAKES & TYPES OF ELECTRIC OR PNEUMATIC GEAR SELECTOR SYSTEMS. FLATSHIFTER MAX ELECTRIC GEAR SELECTOR SYSTEM ALSO AVAILABLE FOR THESE PADDLES. SINGLE OR DOUBLE SHIFT ARM OPERATION. Flatshifter paddles, double or single arm operation. OFFSET AND HAND SPAN ADJUSTABLE. SPECIFICALLY DESIGNED FOR FORMULA RACE & KIT CARS. BEST VALUE PADDLE’S AVAILABLE BY FAR! CHECK FOR YOURSELF. PRESSURE SENSITIVE BUTTONS ENABLE HALF SHIFTS FOR NEUTRAL SELECTION. PLEASE NOTE THAT THE PADDLE SHIFT SYSTEM IS NOT SUITABLE FOR ALL DISHED TYPE STEERING WHEELS. The use of paddles not only allows gearshifts to be made far faster and clutchless while full throttle (see Expert system), it allows the driver to keep both hands on the wheel, both eyes on the road and provides them with much more time to concentrate on their driving. I had 2 test-passes where the car-setup and everything worked perfectly. And during these test-passes, I can only say that the Flatshifter max with paddles performed superior to anything I’ve ever tried before. And I outperformed every other driver with nearly a second each lap. The benefit of having both hands on the steering wheel and totally precise up and downshifts, gave me 100% focus on driving the car. I could attack every corner in a manner no other driver could match. I got a lot of questions about the system and of course recommended it 100%. You may get a few mails shortly with some questions, with reference to me. Direct Deposit to our Bank Account. Telegraphic Transfer (International your Bank to our Bank).